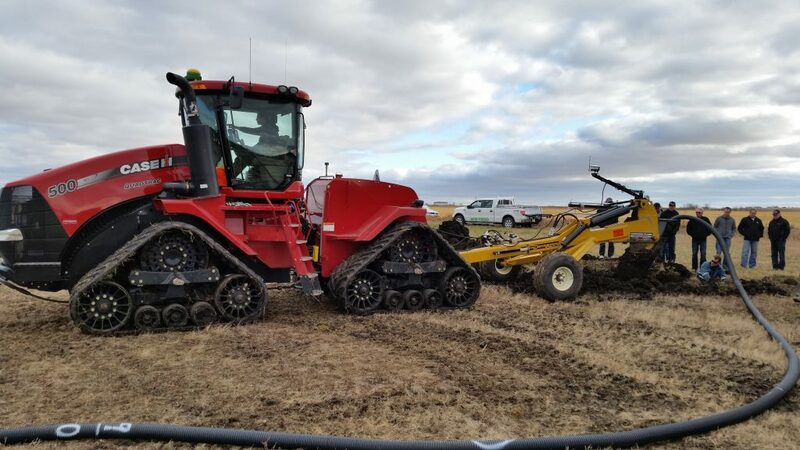 In parts of northeastern Saskatchewan, excess moisture and high water tables have prevented some growers from seeding certain fields in the Melfort area over the past few years. Water table levels have been monitored in the area since an observation well was installed in 1967, with the highest levels ever recorded in 2014. Water levels declined consistently from the mid-1970s until 2004, when they began to rise significantly through 2014. With the high cost of cropland, growers can't afford to not crop all of their acres. As the first step before undertaking a tile drainage project, the landowner must contact the Saskatchewan Water Security Agency for approval. One of the most important factors is having a plan of where the water discharge from the tile drainage will be released, and to confirm that there is a viable outlet or point of adequate discharge, which means the amount of water being contributed from the tile drainage is insignificant compared with the amount of water flowing in the creek. For this project, the Melfort Creek provided the point of adequate discharge. The costs for tile drainage vary depending on soil texture, design and installation requirements. On coarse textured soils, the tiles can be placed quite far apart, reducing costs, but in clay soils, the tiles need to be placed closer together at about 40 feet apart, which requires a lot more tile drainage material. For large areas or entire fields, usually the most efficient and cost-effective design is a parallel installation. In some situations, a targeted design can be installed for smaller problem areas where other parts of the field do not require drainage. In 2015, half of the field was seeded to canola and the other half, which was badly affected by salinity, was left in the permanent forage stand. Although there isn't previous yield map data for comparison, the canola yields in 2015 appeared to show a good response to the tile drainage. The grower was pleased with the results and removed the remaining permanent forage in the fall of 2015. The entire 40 acres was seeded to barley in the spring of 2016. Brandt has received a lot of calls about this project and believes it has probably generated the most interest he has ever had on a project. There is lots of interest in tile drainage projects in the area and all along the east side of the province. Planning ahead, getting necessary approvals and being able to plan for installation after harvest if conditions allow are the key. Don't miss out on our other web exclusive content! Sign up today for our E-newsletters and get the best of research-based info on field crops delivered staight to your inbox.